In the latest Cabinet of Curiosities, we’re asked to write about a Christmas treasure. I’m pulling out of my cabinet of curiosities the item that wasn’t there every Christmas. This is about my Grandma Lassalle and the lost pajamas. My Grandma was a fine seamstress. She sewed everything. Each year she made pajamas for all the grandkids. That was alot of kids, let me tell you! We were expected at Grandma and Grandpa’s house on Christmas Eve. We’d eat some food and open gifts. It was our once a year get together with all the cousins. The scene inside was always the same. Cousins scattered throughout the house. Uncle Vernon quizzing my brother on math. My Aunt Julie helping Grandpa get in place to play Santa. The living room was always the same with the fake tree with with a rotating light spinning red and green on the tree. It was very modern and somewhat mesmerizing. And, there was Grandma searching through the packages. She wasn’t checking to see if her name was on any tags. Nope! Every year Grandma lost someone’s pajamas. Sometimes they were in the wrong box. Sometimes hidden in her bedroom. And, sometimes the recipient didn’t get their pajamas until Spring. It’s one of my fondest memories. It makes me smile because I’m a little absent minded like Grandma. I’ve lost presents before. We draw names and I’ve bought presents for the wrong people. So, when I laugh at poor ol’ Grandma and her lost pajamas, I’m laughing at me too. I guess some things are handed down. I couldn’t find a photo of the pajamas (typical!) 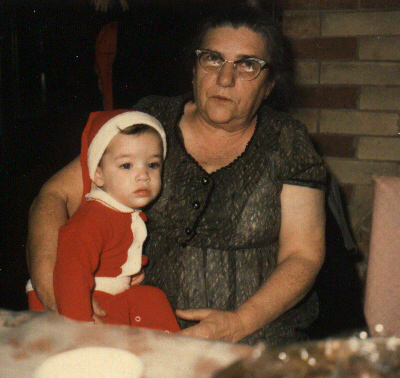 but here’s a shot of me and Grandma ca. 1966.